Segmentectomy for lung cancer is usually required in patients with early lung cancer located in the lung periphery. This procedure has been used for the diagnosis of a solid lung nodule, resection of pulmonary metastasis from extrathoracic malignancy, and sometimes for patients with limited cardiopulmonary reserve who cannot tolerate more rigorous procedures than a lobectomy. A less invasive approach (e.g., video-assisted thoracic surgery [VATS]) for segmentectomy is also a viable option, as treatment of lung cancer and mediastinal lymph node dissection by VATS has been reported as a safe and oncologically feasible procedure and might be considered for the initial treatment of small sized lung cancer less than 2 cm, and in low-risk patients. An uniportal VATS approach for segmentectomy is usually more complex and difficult than for lobectomy. A thoracic surgeon, experienced in the uniportal VATS approach, could achieve acceptable outcomes using appropriate localization techniques and proper division of the intersegmental plane in this limited surgical view. However, the benefit of the uniportal VATS approach is not evident and there is no proven evidence of superiority over the conventional multi-port VATS approach. 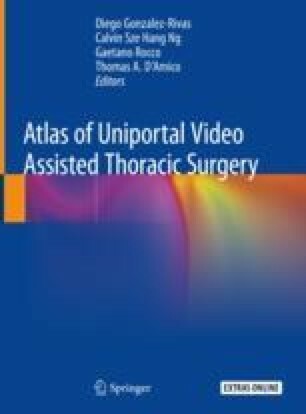 This chapter addresses the technical considerations of uniportal VATS segmentectomy and suggests current options for localization and visualization of the segmental plane during the uniportal VATS. In addition, we review the literature supporting the safety and feasibility of uniportal VATS segmentectomy. The online version of this chapter ( https://doi.org/10.1007/978-981-13-2604-2_25) contains supplementary material, which is available to authorized users.